It took us a little while, but we can now share with you the summary for our debate in the House of Commons on child abuse within a faith setting. The summary gives you a run-down of the speakers’ speeches, the questions asked by the audience and links to organisations mentioned, individual guests who spoke and debate materials. We hope you find the summary interesting. On Tuesday 18th November, we helped to organise and chair a debate in the House of Commons on child abuse and its existence within different religious settings, including the Catholic Church, the Church of England, Judaism and Islam. The debate lasted for two and a half hours and when we asked the audience if they wanted a short break at the half way point, they unanimously declined. It was a very thought-provoking evening, filled with peaceful questions and an audience who graciously sat through seven panel speeches and launched themselves into the discussion with many and varied views, all fascinating. We can now share some photos of the event with you, as well as the audio of the panel delivering their speeches. We hope very much that more media will be made available in the next few days, but in the meantime come and relive the debate with us. It is officially the day our debate takes place, as we move through the last few hours before we begin what we’re sure will be a very interesting evening in the House of Commons. “Religious Power: Risk and Regulation”, will be looking at religious authority, its regulation and the extent to which that regulation has failed to safeguard against human rights breaches in the UK, and internationally. The debate will look at child abuse within a faith setting and ask whether religious leaders are addressing the problem sufficiently, and whether the current inquiry into child abuse has placed sufficient emphasis on this area of child sexual abuse and exploitation. If you are coming to the event, please feel free to tweet about it whilst you’re there, using the hashtags #RRR #ChildAbuseDebate and #PanelInquiry. If you were unable to grab a seat this time, don’t worry, we will be posting up the speeches, audio and photos of the night for you shortly after the event. 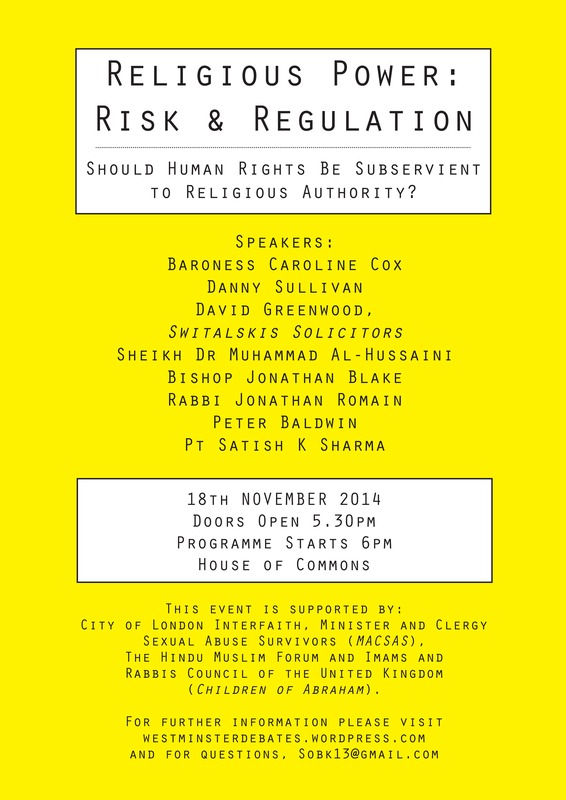 Not long to go now before our next event in the House of Commons and we have a fantastic poster to show you, which highlights our debate on the 18th November, “Religious Power: Risk and Regulation”. This debate will look at religious authority, its regulation and the extent to which that regulation has failed to safeguard against human rights breaches involving child sexual abuse and exploitation. We are delighted to welcome Danny Sullivan as a panel speaker for our House of Commons debate, “Religious Power: Risk and Regulation,” which will be looking at child abuse within a faith setting. Danny is the Chair of the National Catholic Safeguarding Commission for England and Wales. This independent Commission was set up by the Catholic Bishops of England and Wales following the review into safeguarding in the Catholic Church in 2007 by Baroness Cumberlege. Danny has worked in the education and justice sectors. He was Director of Education for the Diocese of Oxford under Bishop Richard Harries. He worked as a senior civil servant with the Magistrates and Crown Courts in London for five years up until his retirement in 2008. Following his retirement he led a project for the Foreign Office and Ministry of Justice in Algeria initiating and developing judicial collaboration between the two countries. Danny is also a retired Hampshire magistrate having sat in the criminal and family courts. He most recently accompanied two survivors of clerical abuse in England to the meeting in the Vatican with Pope Francis. You can read more about our event here and read about our other panel members here, too. With ever-growing concerns surrounding child sexual abuse within a faith context and the current investigation into nationwide child abuse by the Lord Mayor Fiona Woolf, our debate, “Religious Power; Risk & Regulation” has been created with a view to support and inform this inquiry and to open up discussion with faith groups and members of the public in the UK. The debate will take place in the House of Commons on Tuesday 18th November, at 6pm. Co-hosted by several respected religious organisations, who promote peace and understanding between faiths and a non practicing public, this debate hopes to create an ongoing dialogue between the most senior members of our clergy and government. This is an open event, so if you would like to attend, please email Natasha at Sobk13 at gmail dot com. Thank you. Please note that places are going fast, so do book now to avoid disappointment. Together with Family Law in Partnership, Researching Reform hosted a debate in the Palace of Westminster on Monday 12th December, 2011 on the riots this August and what part the family justice system could play in supporting families and easing social unrest. The speeches for the evening are now up on the site and a summary of the evening will follow shortly. There are also photos to take a peep at, the quality of which we apologise for as we found ourselves chairing the debate unexpectedly and as a result we were not able to take photos whilst the event was happening! (But we tried to do our best with camera phones)…..
You may note people smiling or even laughing in some of the photos. Strange, but true. If you’d like to see more about the debate, you can access its home page, here, too. 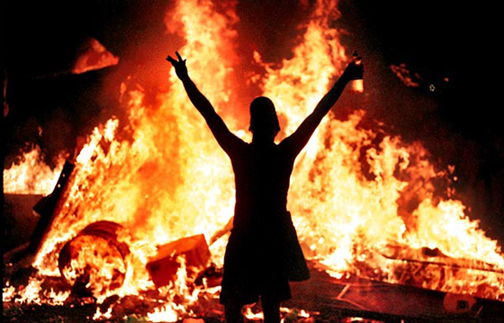 Westminster Debate on the Riots – It’s Today! As the Westminster Debate, Supporting Families After the Riots and the Role of Family Law, begins its count-down this morning, our panel members are getting ready for the evening’s events. Elaine Halligan, who is one of our lovely panel members and the CEO of The Parent Practice, shares a video below about children and how they view us, adults and parents, as role models. We should explain that the video is emotionally very disturbing, but in the wake of the debate, a very important addition to the discussion surrounding social exclusion and the way young people view the world. This debate has been sponsored by Family Law in Partnership LLP, who are widely regarded as the top collaborative family law firm in London. It’s not too late to join us at the Palace of Westminster; if you would like to come to this public event, we will be sending out invitations until 4pm this afternoon, so why not come along and join in? Westminster Debates are always lively and friendly and everyone is welcome. Massive kudos to The Guardian for their in-depth efforts at studying the riots that took place in London and beyond this Summer, which you can spot on their UK Riots section. Tacked on to that is their Reading the Riots page, which is highly informative and the reason for our post this morning as they have recently unveiled parts of the study they did in collaboration with the London School of Economics, on the riots. The report by LSE and The Guardian, is based upon interviews of 270 people, who rioted in London, Birmingham, Liverpool, Nottingham, Manchester and Salford, first person accounts from rioters and 2.5 million riot-related tweets (phwoar!). The study will be released in parts over the next five days. (The interim report is available in full here). Researching Reform was happy to note that our belief around the gangster theory being a myth was true as the report explains gangs were not at the heart of the riots, social media was not used in any real effort to formulate widespread attacks and that the rioters themselves were from very diverse and eclectic backgrounds. The motivations for rioting appeared to be many: political dissatisfaction, intensely felt social exclusion and very tellingly, how people, especially teenagers and young adults, felt mistreated by authority figures. Perhaps a warning signal that government should not seek to take a step back into the dark ages and rule with an iron fist, but should perhaps evolve the cultures inside our justice systems to offer meaningful solutions to what are sure to be growing problems. If this topic interests you, why not come along to our debate in the House of Commons on Monday 12th December which will be looking at the riots and what professionals inside the family justice system and beyond can do to help support young people and make sure they receive the respect and compassion they deserve. Everyone is welcome, but please do let us know if you would like to come as seats are limited. You can read more articles on the riots on our sister site, here.